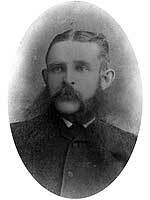 Born at Peterborough, Ontario on 13 December 1847, son of barrister Elias Burnham and Ann Whitney, he moved with his family to Emerson by 1881 where he worked as a lawyer. He and wife Ellen Elizabeth Cluxton (c1845-1925) had three children: Frederick W. E. Burnham, Clara Ethel Burnham (1880-1934, wife of Henry Walter Whitla), and Robert Maitland Burnham (?-?). Defeated in the 1879 provincial general election and elected at the general election in January 1883, he was subsequently defeated by Charles S. Douglas at a by-election held five months later. He later moved to West Superior and died there sometime before 1906. “Personal,” Manitoba Free Press, 27 April 1883, page 15. “Pioneer resident of Manitoba passes away,” Manitoba Free Press, 17 February 1925, page 4. “Deaths and funerals,” Manitoba Free Press, 18 February 1925, page 16. We thank Fred Hill for providing information used here.